Last year on the eve of Phoenix Comicon, Elevengeddon assembled a huge force of sci-fi and fantasy authors for a booksigning at Poisoned Pen in Scottsdale. This year, it is back, and bigger and better than before! Seriously, this time around it involves wristbands and delayed entry times, all because of some dudes named Pat Rothfuss and Brandon Sanderson. We are limiting the number of books that can be signed by Brandon Sanderson and Patrick Rothfuss to three each per person and we wanted to let everyone know in advance if possible. We will be issuing colored wristbands that will correspond to 45 minute units of time. We will begin issuing these at 6:00 PM and the first group will run from 7:00-7:45 and so on. We will be asking people to line up by the front door at the beginning of their group’s time. They will have to line up outside if numbers are big, so we want them to be prepared. Wristbands will either be issued by the front counter or, if numbers are big, by staff members in front of the store. Wristbands are free, however we are requesting everyone to buy something, though it is not required. As a personal aside: with signings like this, it is courteous to always buy at least one new book, even if you are bringing a stack to have signed. It’s the best way to say “thank you!” to the bookseller who is hosting the event. 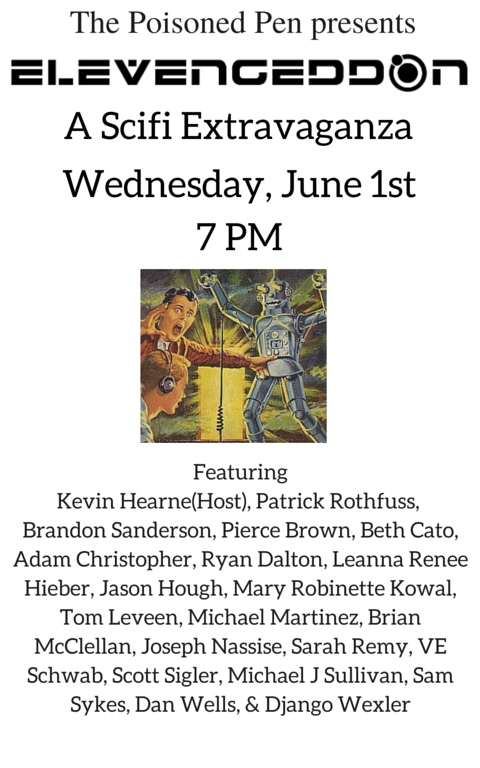 I will be happy to sign copies of Clockwork Dagger, Clockwork Crown, napkins, ARCs of Breath of Earth, any anthologies that feature my work, underwear, shaved cats, etc. Plus, you can get snazzy stickers featuring my book covers! 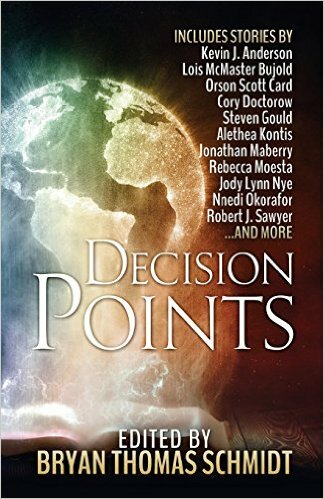 Decision Points Anthology is Out! Posted by Beth on May 26, 2016 in anthology:story, Blog | Comments Off on Decision Points Anthology is Out! Life is full of decision points—those key moments when what we decide can change everything for better or for worse. These 20 tales describe such instances in young people’s lives, ranging from tragic to triumphant, from horror to fantasy to science fiction. Written by authors new and old, those known for Young Adult writing and those known for Adult novels, a few new and barely known at all, these stories will make you think, make you laugh, make you feel angry, sad, determined, etc. as you examine choices and consequences and consider the many paths a life might take and think about your own. Edited by Hugo-nominated editor Bryan Thomas Schmidt, Decision Points includes both brand new and reprint stories by award winners and bestsellers such as Orson Scott Card, Lois McMaster Bujold, Robert Silverberg, Robert J. Sawyer, Kevin J. Anderson, Jody Lynn Nye, Cory Doctorow, Alethea Kontis, Jonathan Maberry, Nnedi Okorafor, Steven Gould, Mike Resnick and more. Top authors telling great stories about life changing decisions that may well change yours. “An Echo in the Shell” tells the tale of a teen girl with a very ill grandmother. She has to decide to accept something pretty horrible about the illness is true, and then decide what to do about it. Probably the darkest tale in the volume, you find yourself second-guessing the girl’s choices as you identify with her. You can buy Decision Points in print or ebook at places like Amazon and Barnes & Noble. Memorial Day weekend is coming up, so let’s do make something fresh and summer-y! How about chewy bars that taste like lemonade? These bars are soft and chewy with a delightfully fresh flavor. White chocolate and lemon make for a wonderful pairing in both taste and texture. I’d like to say that these kept well for days, but I really don’t know. They stayed yummy for one day, at least. When my husband took these to work, a co-worker told him, “Your wife can make these any time she wants.” I always welcome that kind of encouragement to bake more! Modified from A Kitchen Addiction. 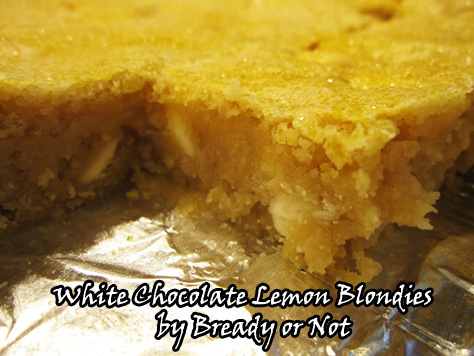 These blondies are lemonade in cookie bar form! They are soft and tender, with a fresh flavor. Makes an 8×8 or 9×9 dish. Preheat oven to 350-degrees. 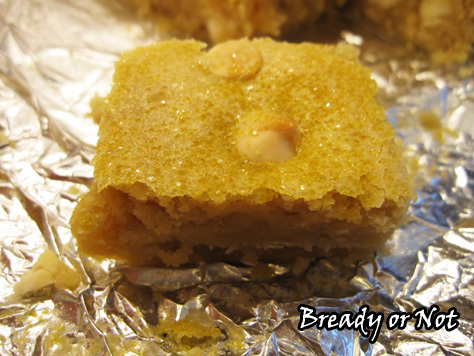 Line an 8x8 or 9x9 inch baking dish with aluminum foil and apply non-stick cooking spray. Cream together butter and both sugars. Add lemon juice, eggs, and vanilla extract, and beat until combined. In a separate bowl, stir together the dry ingredients: flour, lemon zest, baking powder, and salt. Gradually add the flour mix into the wet ingredients. Stir in white chocolate chips; dough will be thick. 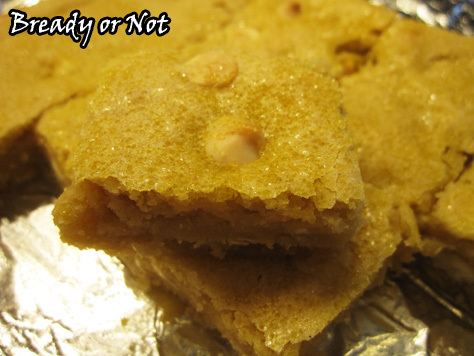 Spread into the bottom of the ready baking dish. An offset spatula works well to smooth it out. 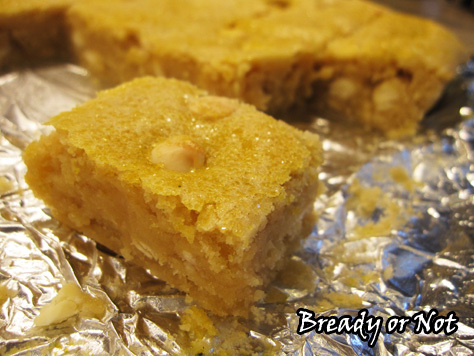 If desired, sprinkle sparkling or turbinado sugar all over the top. Bake for 20-25 minutes, until it passes the toothpick test. Set on a wire rack to cool completely, then use foil to lift contents to a cutting board. Cut into bars. Shadow of the Void is out today! 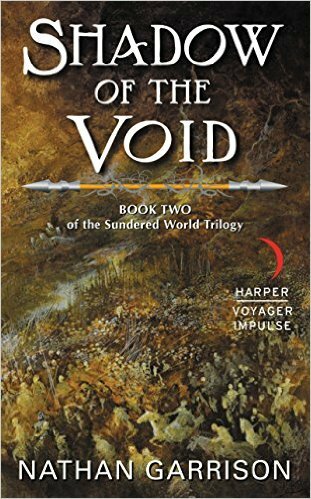 This second book of the Sundered World Trilogy promises to be awesome. Author Nathan Garrison is one of my peers in Harper Voyager Impulse, and I interviewed him about the new release. – Who are some of your favorite epic fantasy authors? Along with classic authors such as J.R.R. Tolkien and Robert Jordan, my favorite ones still writing today are Steven Erikson and R. Scott Bakker. It’s hard to top the scope and complexity of their worlds, yet they still manage to get deep down into their characters, and the personal struggles they all go through amidst events that shake the world. I also recently discovered Janny Wurts, and based off what I’ve read so far, those top two are going to have some competition for their spots! – Do you have a favorite character in your cast? Why this person? Vashodia is hands down my favorite character to write. I have to limit scenes from her point of view, however, because she simply knows too much–probably more than me even. She’s so fun because not only does she have unspeakable power, but she also takes such delight in proving others wrong. – You get to choose your own magical power. What will it be? Flying is close, but if I was able to choose anything, I could never pass up time manipulation. Though, I’d probably just use it to catch up on sleep and read more books. – Epic fantasies are notoriously complex. How do you keep the details straight as you write in your Sundered Worlds trilogy? Very. Meticulous. Outlines. That, plus my wife, editor, and copyeditor keep me honest, and my manuscripts coherent. You don’t want to know what my books look like before a thorough scrubbing from them. – Your new release is the second book and you’re working on the third right now. Can you share the title and a projected release date? The Light That Binds is the final book in my Sundered World trilogy, and has a projected release date of February 15th 2017. One day past Valentines Day! Which is appropriate, since it deals (far more potently than the first two books) with the theme of love. For many, a new dawn has risen, as freedom from the tyrannical Emperor Rekaj has created a land replete with opportunities. But for those who had lived outside the Veil for generations, the sudden appearance of a new nation is not cause for celebration–it is the cause for war. Yet, even as the political machinations of men and mierothi and valynkar start to manifest on a global scale, there are a few playing their own games. Whether it’s the powerful combination of Vashodia and Jasside trying to carve out a country for those freed from the Veil, or the warrior Mevon and assassin Draevenus forming an unlikely alliance in search of the dark god Ruul, the world is in chaos…which might be exactly what some are counting on. Buy the 1st book, Veiled Empire! Buy the brand new 2nd book in the trilogy!